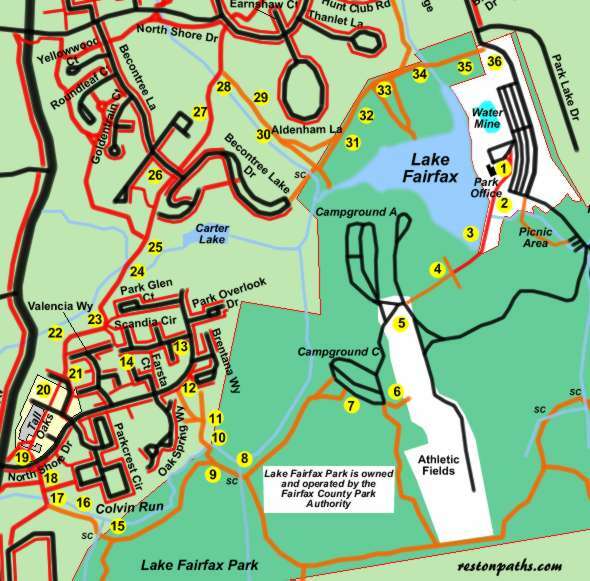 This walk will take you around Lake Fairfax but it will be necessary to leave the park grounds and walk on some of the Reston trails to do so. Campers at Lake Fairfax may find part of this walk helpful to visit the stores at the Tall Oaks Shopping Center. The long loop will take you through that shopping center. The short loop shares a minor stream crossing with the long loop. The long loop has a second stream crossing that is normally easy to negotiate. Pictures are provided of both crossings. Most of the route is over natural surface trails although there are some paved trails in Reston. The walk starts from the large parking lot near the entrance to the park. A driveway leads from the parking lot to the park office. Take the asphalt trail leading towards the dam from the driveway. The path crosses the Lake Fairfax dam. The path climbs a hill after crossing the dam. At the top of the first hill the path changes to a gravel surface and starts up a second hill. At the top of the second hill a road intersects from the left. Continue straight on that road as it curves to the left towards the other side of the field. Campground A will be on your right. The road will enter the woods, turn slightly to the right and then to the left. Do not turn right onto either of the intersecting roads from that direction. You are now in Campground C.
The road turns sharply to the right. Follow the road down the hill. Look for a sign marked Nature Trail on your left. The trail can be seen crossing a small bridge over a ditch. Take that trail as it turns to the right and then to the left to follow Colvin Run upstream. At the next trail intersection take the trail to the right across the small stream. Rocks provide a convenient means to cross the stream. A short distance after crossing the stream a trail intersects from the right. If you plan to take the short loop turn right. Otherwise, stay on the present trail to the left to continue on the long loop. Go to step 10 in the instructions if you chose the short loop and step 15 if you chose the long loop. At the top of the hill take the trail to the left down a short hill. Turn right onto the intersecting trail through the woods in the back of the homes. There should be a ditch on the left side of the trail. The trail crosses a grass section and intersects with North Shore Drive. Turn right and follow the sidewalk until the next street on your left. Turn left and follow the sidewalk along Scandia Circle. Stay on the sidewalk until the end of that street. Take the asphalt path down the hill on the right side of Scandia Circle. It will go behind the homes on the adjacent street and connect with an asphalt trail on the side of a hill. Turn right onto that trail to rejoin the long loop. Go to part 23 in the instructions. (Long loop) Turn right at the next trail intersection. After a very short distance the trail will cross a small stream. The crossing is pictured. Stay straight on the trail as it follows Colvin Run on the right. The trail intersects with an asphalt path. Turn right and cross Colvin Run on a bridge. After crossing the bridge turn left at the first trail intersection and right at the second trail intersection. The trail enters a tunnel under North Shore Drive. After exiting the tunnel take the steps to walk between the stores at Tall Oaks. Continue along the sidewalk in front of the grocery store until the stores end. Cross the short section of driveway and continue straight along the sidewalk through the parking lot headed towards the tall building at the end of the lot. After crossing the parking lot turn right and follow the sidewalk for a very short distance. Turn left onto the wide asphalt trail on the side of the tall building. The trail goes behind the homes with woods and a steep hill on the left and houses on the right. The trail intersects with several trails on the right as it curves to the left. The short loop rejoins from the trail on the right. Stay on the trail to the left as it goes down the hill with the woods on the left. The trail crosses a stream on a bridge and starts back up a steep hill. Do not take the intersecting trails to the left. The trail crosses Becontree Lane. Stay straight on the current trail with the apartments on your left. The trail enters the woods as it goes down the hill. The trail crosses a stream on a bridge. Just after this crossing a sign marks the intersection of the Buttermilk Creek Trail. Turn right to follow that natural surface trail. The trail crosses the first culvert. Look for the next one. The trail crosses a second culvert. Turn left onto the next intersecting trail to the left going up a small hill. The trail intersects with another trail. Take that trail to the left. The trail climbs a hill after crossing a gully. Look for a trail to the right followed by a clearing on the right at the top of the hill. A marker at the end of the clearing signals that the Buttermilk Creek Trail turns left at this point. Stay straight on the current trail down the hill as it starts to look like a dirt road. The trail crosses a creek at the bottom of the hill. Continue straight on the trail. The trail becomes a gravel driveway. Continue along this trail. The trail emerges at the entrance to Lake Fairfax Park. Walk across the grass back to the parking lot where the walk started.